Hi Guys!! So I'm actually doing two recipes today, and of course, what better way to celebrate Halloween than with some delicious cakes and desserts! I'm also doing a one off article all about one of my favourite HP themed bands! Be sure to check that out as well! P.S. Remember, if there's a specific theme you want me to follow, be sure to pm me!! 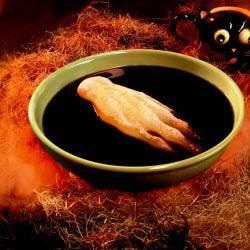 A must every Halloween - this recipe is great fun! A fake hand is frozen in a rubber glove and then presented in a bucket or glass punch bowl. Dress the hand up with a few Halloween gimmicks, like spiders. To make the frozen hand: Wash and rinse the outside of a rubber glove. Turn the glove inside out and set aside. In a 1 litre measuring jug, combine the thawed raspberries and cranberry juice. 2. Pour half of the raspberry mixture into a small saucepan. Sprinkle the gelatin over it and let stand 2 minutes. Warm over low heat, stirring constantly, just until gelatin dissolves. Mix back into the reserved raspberry mixture in the measuring jug. 3. Pour raspberry mixture into the inverted glove. Gather up the top of the glove and tie securely with kitchen string. Freeze until solid, or several days if possible. 4. To serve: Carefully cut rubber glove away from frozen hand. Place frozen hand, palm side up, leaning against side of a large punch bowl. Pour in ginger ale and sparkling cider. Garnish with Gummi snakes. A favourite at kids' Halloween parties. Use a shop bought chocolate cake mix and icing if you're pressed for time, or use your own cake and icing recipes to prepare these cupcakes from scratch. 1. Prepare cake mix according to packet directions. Pour mixture into muffin tins and bake as directed on cake mix box. Let cupcakes cool thoroughly before icing. 2. Spread cupcakes lightly with chocolate frosting. Sprinkle biscuit crumbs on top. 3. Cut gummi worms in half (as many as you like). 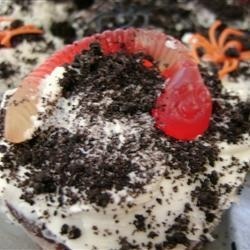 Put icing onto cut end of the worms and stick to the top of cupcakes. You can use as few or as many as will fit on each cupcake. Let icing set for 10 minutes and then enjoy. This Months Theme: Harry Potter! You will also need some candy melts (whatever your choice)! Cream together your butter and sugars until well-combined and fluffy. Mix in your eggs, one at a time and mix after each one goes in for approx. 1 min. Then add the vanilla and butter flavouring. Pour your buttermilk in a little at a time and then do the same for the cream soda. Mix all the other dry ingredients in a separate bowl and add them to the mix the same way as you did it for the buttermilk and cream soda. Line a baking tray with baking paper and fill it with the mix. Bake for 15-17 minutes in a 120 degree oven. Roll out the Gum Paste until 1/8" thick. Cut yourself a template using card stock. Using an X-acto knife cut around the template as careful as possible. Set them on a smooth surface to dry for about 10 mins. Cream your butter until light and fluffy. Then beat in your butterscotch, salt, vanilla and butter flavouring until well-combined. Now beat in your powdered sugar a cup at a time until it reaches the right texture for you. When the cake is cool, crumble it into a bowl. Roll out small balls and place them on a smooth surface. Place them in the freezer while warming up your candy melts. Take your cake balls out of the freezer and make a hole with the stick, secure them with a bit of the candy melt mixture. Repeat for all the cake balls. Then very lightly dunk them into the mixture and stick them in some styrofoam will they harden. 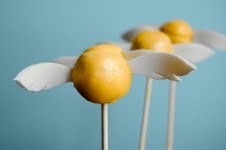 To attach the wings make a slight cut on the side of the cake balls and slide them in there. Hi, My names Matilda! I'm a new ambitious 1st year! I'm interested in Baking, writing, music, poetry and many more! When I joined HOL (which was not that long ago! ), I was drawn to the forums and clubs that they had. When I was sorted into Gryffindor, I was soooooooooooooooooo excited for the year to start! In this column I will be posting 2 monthly recipes which follow a certain theme! They will include images!! Hopefully, my recipes will get you interested in magical baking and decorating fun! If you want to suggest a theme, just PM me!! !